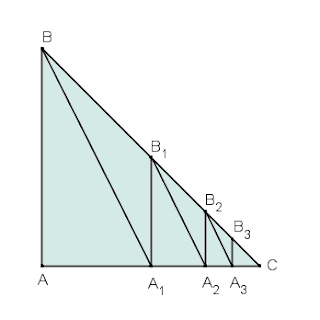 The figure ABC is a right-angled triangle with lengths AB = AC = 4. Point A1 is the mid-point of the line AC; the point A2 is the mid-point of the line segment A1C, and so on. The line segment A1B1 is perpendicular to AC and intersects the line BC at point B1; similarly A2B2 is perpendicular to AC and intersects BC at B2, and so on. Hence, if H is the length BC, find the value of D/H.